At the opening of one of the sections of the St. Petersburg International Economic Forum, Russian President Vladimir Putin gave an aggressive speech, talking tough on international issues, while offering concessions on the domestic front and repeating the call for transforming the Russian economy and moving it up the World Bank's "Doing Business" rankings. Putin began his remarks by reiterating his call for the G20 to take the lead in global affairs. Specifically, Putin said that the BRICS countries were ready to contribute $75 billion to the IMF ($10 billion from Russia alone), but they should have more say in the organization if they do. Later in the speech, Putin said that Russia was willing to invite foreign investment, "even into our strategic sectors," but that for this investment to happen, there must be some quid pro quo. "Russian companies that wanted to invest in other countries have faced a wall and seen artificial pretexts that prevented this investment," Putin said. "This is far from being a partnership." Putin also stressed the need for "accountability" - an implicit dig at the poor governance in the United States that precipitated the global financial crisis. "We must end the petty populism of the politicians and the unrestrained fiscal speculation, as it is dangerous," said Putin, laying the blame for the world's crisis and its inability to emerge from it on the U.S.
Putin then moved on to discuss his the domestic agenda. The Russian president rattled off the country's economic achievements of the last years, including an inflation rate that hit a 20-year low and continued low unemployment rates; it currently stands at 5.4 percent. However, Putin noted that one of the reasons Russian unemployment is so low is because existing capacity in the economy has been exhausted. This means Russia needs heavy investment to create new jobs. To do this, Russia is targeting hi-tech sectors. Putin repeated his previous promises to boost the share of hi-tech industry in the economy, as well as move Russia up the World Bank's "Doing Business" index. He then rattled off a list of changes he planned to make to lift Russia from 120th in 2012 to 20th place. Former regional governor Boris Titov has also been appointed a ombudsman for business and will be tasked with making sure doing business in Russia gets easier. More radically, Putin promised there will be a new budget rule that will prevent the budget from being set on the basis of the oil price forecast. Currently, if the price of oil rises, the Duma has more money to spend, but Putin suggested that the price of oil will be capped, adding that any "windfall" revenues from higher oil will be channeled into the various reserve funds. Last week, Kingsmill Bond, chief strategist at Citigroup, called for Russia to cap the oil price prediction in the budget at $80, which would ensure the budget was run on a more stable basis, but Putin did not name a figure in his remarks. Finally, Putin made some concessions to the opposition movement, which has been holding demonstrations since December. He committed himself again to the need for developing civil society in Russia. 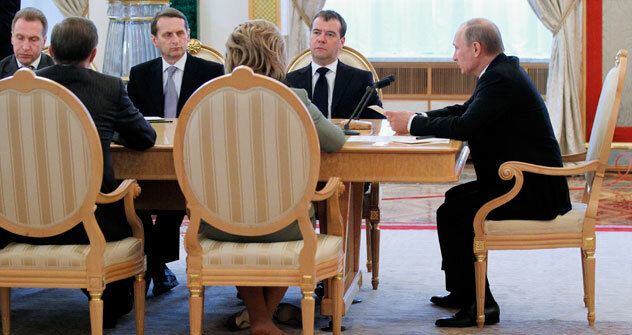 "We have seen a civil society start to emerge in Russia and this is due to a decade of growth. This is healthy and we understand that a mature economy can't become a developed country without a civil society. The state must move towards this so that we have not only a legitimate government, but also one the people trust. Minority interests must be respected and accommodated where it is possible," Putin said. At face value, this is a very liberal comment, but the question remains as to the pace of change. Putin has always said he will go slowly and wants to remain in charge of the process. He went on to warn that any change must be done "within the framework of the law." However, in a surprise move, Putin announced that any Russian citizen who collects over 100,000 authorized signatures can now propose a law that will have to be considered by the State Duma. Although this initiative will probably not lead to a lot of change, it does provide the nascent opposition with a real tool to propose policy and laws. This article first appeared at Business New Europe.